Is The Three-Fund Portfolio Right For You? - Can I Retire Yet? Investing is simple. But it’s not easy. Most people do best with a passive investing approach utilizing index funds. This minimizes unnecessary investing costs, taxes and common behavioral mistakes made when more active approaches to investing are used. But within this framework, there are countless options for building your portfolio. Strategies range from holding a single fund to building a portfolio of ten or more funds. Although these strategies have more similarities than differences, it is easy to get hung up on details and get stuck in paralysis by analysis. Ultimately, we each have to decide on a strategy and portfolio that makes sense for us, then act on it. Taylor Larimore recently released The Bogleheads’ Guide to the Three-Fund Portfolio. This concise easy read makes a compelling argument for this elegantly simple approach to investing. Here is a review of key concepts of the Three-Fund Portfolio, if this is a strategy you should consider for your portfolio, and whether this is a book you should add to your library. What is The Bogleheads’ Three-Fund Portfolio? The Bogleheads’ Three Fund Portfolio consists of three total market index funds; Vanguard’s Total Stock Market Index Fund (VTSAX), Total Bond Market Index Fund (VBTLX) and Total International Stock Index Fund (VTIAX). The Bogleheads are named after Vanguard founder John Bogle. You can build a similar three fund portfolio with index funds or ETFs from companies such as Fidelity or Schwab. Owning this portfolio means holding over 3,500 domestic stocks, over 8,000 high-quality U.S. bonds and over 6,000 international stocks in a low-cost, tax-efficient manner. Larimore starts the book with a brief overview of the investment industry, the history of Vanguard and the three total market index funds that make up the Three-Fund Portfolio. He then dedicates most of his short book to outlining twenty benefits of total market index funds. This section of the book makes a compelling case for using an index fund investing approach. However, the majority of these benefits such as no advisor risk (Benefit 1), no individual stock risk (Benefit 5), low tracking error (Benefit 9), and low costs (Benefit 14) are true of well constructed index funds in general. Many of the benefits outlined don’t specifically support the Three-Fund Portfolio over other index investing approaches. This level of specificity is what hangs up many investors when constructing a portfolio. A more compelling argument for using the Three-Fund Portfolio could have been made by focusing on the specifics of this approach that differentiate it from other portfolios, as the title of the book would suggest. The biggest benefit of the Three-Fund Portfolio is its ability to provide massive diversification, low costs and tax efficiency while maintaining simplicity. Larimore explains this as he outlines how the Three-Fund Portfolio provides simplified contributions, rebalancing and withdrawals. He also points out the Three-Fund Portfolio provides simplicity not only for DIY investors, but also caregivers and heirs when an investor can no longer manage their own portfolio. I’d been considering the benefits of simplicity prior to reading the book. Reading it has strengthened my convictions that simpler is better for most investors. I’ve selected an approach for my own portfolio that adds a small amount of complexity and cost, holding eight funds. This allowed me to give more weight to segments of the market which have little representation in total market funds. I also subdivided funds into segments. If history is any indicator, the extra risk and effort of giving increased weight to small cap and emerging market funds and subdividing and rebalancing funds gives me a good chance of achieving higher returns over time. Small improvements in returns could substantially impact our lives, given our long investing timeframe and reliance on investment returns due to my decision to walk away from my career so early in life. However, I helped several family members construct similar portfolios. I’ve since realized most don’t have the inclination to manage that complexity. Nor do they have the need to take on increased risk and cost that comes with it. So we’re gradually moving them towards a Three-Fund Portfolio that’s easier to manage. I’ll likely migrate my own portfolio in this direction over time. Most investors would likewise benefit from a simple portfolio that is easy to manage on their own. Larimore packs a lot of information into a short book. This brevity increases the odds that people will actually read it, implement his recommendations, and thus benefit. For the most part, he hit his mark. The exception was Chapter 5. This section of the book teaching how to implement the Three-Fund Portfolio felt rushed. It could be confusing to a newer DIY investor who seems to be the book’s primary target audience. Larimore devoted most of the first fifty pages of the book to laying out the virtues of the Three-Fund Portfolio. He then started Chapter 5 with a step by step process of how to choose your funds, determine your most suitable asset allocation, and decide between mutual funds and ETFs. After this strong start to the chapter, he advised investing in your retirement plan by looking “first to see if your company plan has a low-cost Target Retirement Fund with a stock/bond mix close to your desired allocation.” The advice to look first to a single target date fund seemed odd, given the emphasis on the Three-Fund Portfolio through the rest of the book. Larimore then tackles a number of complex topics in only six pages. They include advantages of tax-deferred, taxable and Roth accounts and asset location for optimal tax-efficiency. He also addresses dealing with old investments that don’t fit the Three-Fund Portfolio. This section was technically accurate and contained some excellent information. However, it could have been better with a more beefed up explanation of these complex topics. 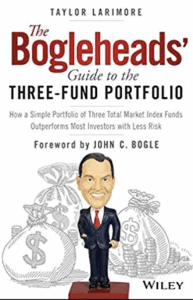 The Bogleheads’ Guide to the Three-Fund Portfolio is concise, packed with valuable information that can easily be completed in a day. In fact, I read the entire book twice on a recent cross-country flight. Larimore’s decades of experience managing his own investments and helping other DIY investors as a leader of the Bogleheads is evident. This book is an excellent resource for a new DIY investor who is overwhelmed trying to put together a portfolio they’re likely to stick with. It will also challenge seasoned investors to test long held beliefs and consider the value of simplifying their investment portfolios. best DIY investment book I have ever read. I would think Taylor’s new book would be in the same class. Agree the Bogleheads’ Guide to Investing and Bogle’s Little Book of Common Sense investing are outstanding. While this book was good, I think I found it a bit underwhelming b/c of the expectations those books set. 1) Capital gains. I have funds in taxable accounts I bought long ago and if I sell, will pay capital gains taxes on them. So I keep them and buy new appropriate low cost funds from new savings and distributions to create and maintain the same balance as the 3 fund strategy described in this article. 2) Tax loss harvesting. You get more flexibility in what you sell to “optimize” income taxes paid. Sure, you can get into sub-optimal situations if you “guess wrong” but there can be clear-cut cases where this flexibility is a pretty clear win. Makes sense. We all have to do what works for us, but in general I think a simple plan someone understands and can implement will serve most people well. Bond funds have just been such bad performers of late. In the three bucket approach (outline s in Kipling), they emphasized buying actual bonds and holding them to term. More co placated, but I confirmed that Vanguard does sell individual bonds. I just havent taken the leap yet to individual bonds, but hope to do so within the next year. For now, I have some bond mutual funds in my 401k and will see how that has performed at the end of the year. I’ve also read about building bond ladders instead of holding bond funds, but it’s a bridge too far for me as I prefer the simplicity of holding a fund and not having to think about it. Curious to hear about your experiences if you care to share as you go. Sounds to me like the book is fundamentally the same as the J.L. Collins book “The Simple Path To Wealth” (also a Bogle variant). Many books about index investing highlight the same principles, but everyone has their own opinions about what actual funds to hold. In truth, none of us know who is right because the future is unknown. The biggest difference between the three fund portfolio (and most of the other books I’ve read on investing) is the importance of including international stocks. JL Collins book, as well as Bogle’s writings, don’t feel that is necessary. I read the Bogleheads Guide to Investing about six years ago and found it very helpful. It was around the time I was getting married and I was trying to get a handle on the best way to combine our portfolios. Prior to that I was using a Target date retirement fund in my 401k and Roth. I learned a lot from that book, which I supplemented with information I gathered from the Bogleheads forum. There are some very knowledgeable and helpful individuals in those forums. As a result, I was able to put together a relatively simple portfolio despite the added complexity of my wife’s poor 401k fund options, as well as the addition of a taxable investing account. I now loosely follow the three fund portfolio, although I am a bit more risk tolerant and don’t follow the “Age in Bonds” suggested. The Bogleheads also recommended a higher percentage of International than I prefer. I am a fan of Collins book and his blog. His current approach is there is no need for international. He feels there is enough international exposure in VTSAX. He also sites increased simplicity and lower expenses ratios as reasons he no longer holds International funds in his portfoilo. I have fully increased the simple portfolio philosophy. These days I grapple more with whether or not to reduce our eliminate internationals. Another question I struggle with is where to hold my Bonds. I currently hold my Bonds in my Roth and traditional rollover IRA (I no longer have access to a 401k and my wife’s 401k has poor bond fund choices) for tax efficiency purposes. However, I am concerned over the lack of growth in my Roth, which ideally I would like to grow as large as possible. Perhaps a topic for future posts? Thanks for the feedback and suggestions Skip. I’m not sure what more I can add to the conversation on whether international funds are necessary or not. There are many opinions on what the optimal portfolio looks like. (Larimore addresses this topic in the book.) Ultimately, they are all just guesses, though admittedly some are more educated guesses than others. I think your approach of choosing an allocation that you understand and thus you’re more likely to stick with is far more important than wasting a lot of time worrying about things you can’t know. As for asset location for tax efficiency, this is a topic I’m very interested in and it’s already on the list. We are retired already, and we are satisfied with how our 401K/IRAs are invested. Our after tax account is invested in over 125 individual stocks that pay dividends. For simplicity in maintaining this portfolio and withdrawals over and above the dividends, we would like to convert to these total stock/bond market index funds. (I had decided on these Vanguard index funds after following JLCollins’ blog.) I’m thinking we would need to convert gradually to avoid a big tax hit in one year. Not sure if my thinking is correct. Does the book cover conversions of stocks portfolios versus starting a new investment portfolio? If the book doesn’t cover conversions of accounts to the three index fund approach, do you have any thoughts on the most efficient way to get through this conversion? The book does cover this topic, but not in tremendous detail. The answer to your question, your thinking is correct. Unfortunately, there is no way of knowing in advance what the right answer is for dealing with this situation. I can’t advise you on how to do this, as it would cross the line from being an educator to giving specific financial advice. I can walk you through my thinking when we faced a similar situation, only with mutual funds instead of individual stocks. *The first thing we did was stop automatically reinvesting dividends. You will pay tax on dividends regardless of whether you reinvest them, invest them in something different or spend them. So it made sense to not keep reinvesting in something we no longer wanted. *Next we considered how much of the value of our stocks were basis (the amount we originally paid for them) and how much was growth (the increase in value since our purchase). Basis is not taxed when you sell, gains are. Some of our investments went up in value and some went down, so we sold all of our losers and enough of our winners that the net gain and loss canceled out. Thus there was no net gain and thus no tax owed. *Once you do this, it is a matter of deciding how much you want to get rid of the old investments. Since you have individual stocks and not mutual funds, there should be no ongoing fees to hold the funds, so I wouldn’t be in any huge hurry to get rid of them if there was a substantial tax consequence. The index merely reflects the performance of all stocks in the market, so some of your holdings are bound to be winners and some losers. There’s no way to know in advance which are which. Your stocks could underperform the index. Then again, they could do better than the index. The only reason I would be in a hurry to sell them is if I was truly worried they’d underperform, was constantly looking at them and it was keeping me up at night. In that case, I’d sell them, pay the taxes and move forward with a new strategy. Yes, it helps to see that what you did confirms my thinking. Thanks so much for the response.